If I could ask one question to a Flames insider right now -- with the assurance that the answer would be truthful and more than one word -- it would be, "Is Dion Phaneuf hurt?" Metrognome and I both noted about a month ago that he looked bad, and that remains the case far too often. He set the bar awfully high in October, he really did: he was playing like a blend of Pronger and Niedermayer (which is to say a mix of the two styles, not an inhuman cross of the best features of both), and effectively. And the other guys just were not scoring when he was on the ice: through the 12 games of October, he was +13/-3 5v5. Too often these days, though, the best way to describe his play is hesitant. He stands still too much; he reacts too slowly; and for a big, strong guy, his posture and stick position when defending a passing lane makes him look small and weak. What follows is five of the most recent examples of this: click for video at the links if it suits you. Jan2 v NYR: is for some reason standing literally shoulder-to-shoulder with Kipper as Roszival unloads from the point; puck deflects in off his chest. Dec.29 v ANA: Ducks on the PP, and Getzlaf gets the puck in the corner and pretty much walks around Phaneuf. Then -- I hesitate to use the phrase "gives up", but -- Phaneuf looks lost as Getzlaf feeds Bertuzzi in Position A for the tying goal. Dec.27 @ VAN: Flames are down 4-3 and Luongo kicks out a long rebound to a couple of Canucks at the top of the circle -- puck goes the other way in a hurry. Phaneuf gets caught standing still, then doesn't react with urgency as Raymond burns up the left side, then receives a pass and beats him cleanly. Eriksson crosses to partially cut off the breakaway, and Phaneuf picks up... no one: Pyatt jams in the rebound. Dec.21 v DAL: Early 1st, half-assed-ly covers a possible feed from behind the net, but doesn't look to see Ribeiro coming into the slot, goal. Early 3rd, loses his stick in a puck battle behind the net, then doesn't seem to know what to do... covers no one, and Hagman ties the game. The Anaheim game is of particular interest to me. For starters, I was there, but it also marked the first time I can recall this season where Keenan gave his ice time away for awhile, rather than continuing to send him out: Phaneuf ended up with a grand total of 16:53 TOI. It was probably overdue, but notable from the 200-level because it's so unusual (i.e. starting a PP without #3). Phaneuf made the lousy play noted above, then was used somewhat sparingly (very sparingly for him) for the last half of the 1st and the early part of the 2nd. Midway through the 2nd, he ended up in a fight initiated by Travis Moen; unfortunately the whistle negated a Flames scoring chance. However, they were down 3-1 when he went to the bin for five, and the Flames scored the 3-2 and 3-3 goals while he was in there. Then the Flames started to get a whack of PPs, and the #1 option on the point was Eriksson and Aucoin; it wasn't until very late in the game that Keenan put him back into his usual role. 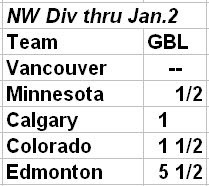 The Flames are in San Jose tonight (830PM MT, RSN West), and with the Canucks and Wild both in action as well, there is a chance that by 11PM MT, the Flames will be tied for 1st in the Northwest (and have the little "*" in front of "Calgary" here). The Sharks are a great defensive team (#2 in GA, #2 in PK%), but aren't too big on the scoring: their 2nd-leading scorer (Milan Michalek) has 23 points, one more than the Flames' 6th-leading scorer Adrian Aucoin. Err, and 5 fewer than the dude I ranted about for most of this post (Dion is 6G/22A). The visitors have won 12 of San Jose's 18 home games this season, but I don't make much of that. The Sharks laid the worst beating of the season** on the Flames, and for all the handwringing, are the 3rd-best team in the league by Win%. The Flames will have to play a really good game to have success. And Tanguay with the SO winner. Go Flames. I really hope that Phaneuf is simply injured, but I doubt it. He still looks like a kid struggling to make the right read and now and then. The fact that he's paired with Eriksson (something I've no doubt mentioned before), sure as hell doesn't help. I'm surprised no one has commented on this headline from TSN regarding the Oilers unbeaten streak. Unbeaten in 2008... simply stellar. Is there such a thing as a "junior jinx"? Phaneuf isn't a sophomore anymore. Wasn't Garpenlov the only Sharks scorer in that 13-1 travesty way back when? Not really. As MG mentions, being paired with Eriksson doesn't help (he's a chaos/high event guy), but he does play with Iginla more than any other forward. And I linked the 5 specific goals because they are bad or "meh" plays in a pretty objective sense. I'd like to see him prevent those goals. Pronger does, Lidstrom does, Regehr usually does. Not really, as far as I can tell. He just seems slower, out of position more often, more tentative. Basically just not as good, as Matt said. To me, he looks like he's even taken a step back from last year, which is truly surprising, though somewhat subjective. Hopefully it's an injury, otherwise the 'big step forward' is looking much less likely. I can't figure out how those match up with the numbers you've posted. Another thing to consider with Phaneuf's performance is Kipper's significantly reduced SV% this year. Bad plays have a way of searing themselves into a fan's memory simply because they led to a goal against. I'm certainly not saying he's playing well...but, for those suggesting he's worse than last year, consider that the difference in partner (Eriksson vs Hamrlik) and the difference in the Flames SV% (.890 vs .917) are probably affecting your perception of his play to some degree. That said, I do wish he'd get back to "October Dion". I was at that Anaheim game too, and I noted that Phaneuf was off the ice for a considerable amount of time. The reason? He got in a fight in his own end while his team had a legitimate scoring opportunity. He was benched.